Application are invited to the post of Driver Post to Indian coast gourd region east chennai. 10th standard passed and valid driving licence with experience. 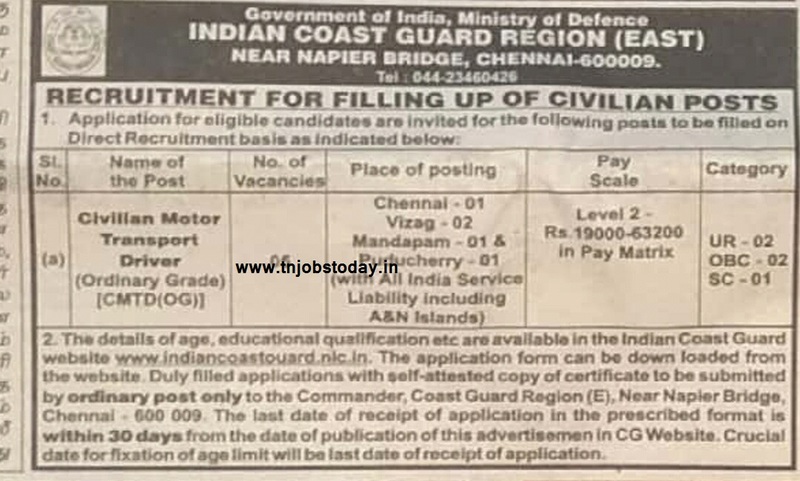 Interested candidates may download details of qualification, age and other details and application from the official website address of www.indiancoastguard.nic.in fill the carefully, and enclose the relevant copies of certificate with self attested to be submitted by ordinary post on or before the 30 days from the advt date to the Commander ,Ministry of Defense,INDIAN COAST GUARD REGION EAST,Government of India, Near Napier Bridge, Chennai-9.